Hear me out: Let’s serve dip for dinner tonight. Or in your kids’ lunchboxes tomorrow. And credit where it’s due: This recipe is cribbed almost entirely from M’s dad as black bean dip is one of his signature party dishes. This gloop is primarily black beans, with just a smidge of cream cheese for richness and some onions, garlic, and spices to make it aromatic. Add in a dash of lime juice for acid, a smattering of shredded cheese on top that gets all melty and crispy in the oven, and you have a quick and hearty dish in about 30 minutes. AND, you can make it an even faster meal if you a small cast-iron or other oven-safe saute pan. 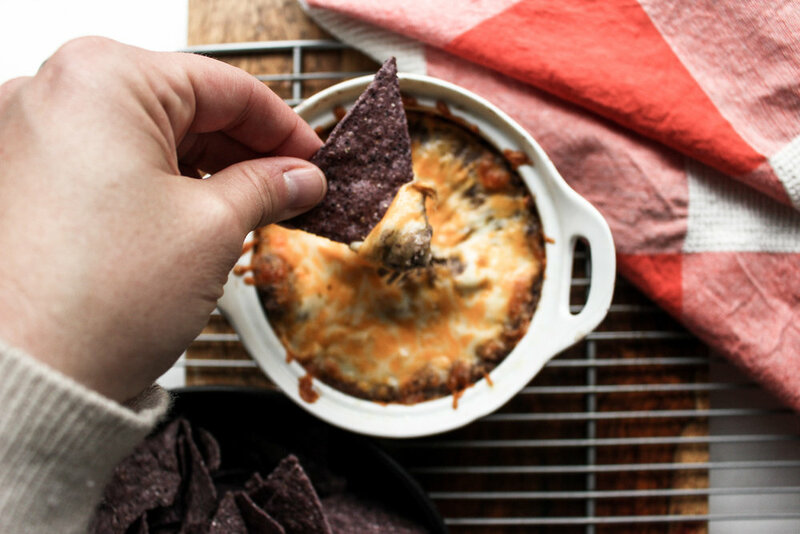 The taste and texture of this dip remind me of refried beans, but better. You can scoop it into tortillas with some fresh veggies for a meatless dinner that’s full of protein. Or add shredded rotisserie chicken or other leftover proteins from the weekend for an even heartier meal. OR squash this concoction between tortillas for a dinner or lunch quesadilla. Also, M is very keen on chips and dip as dinner, but I don’t want him to burn out on guacamole as it’s one of our go-to’s. 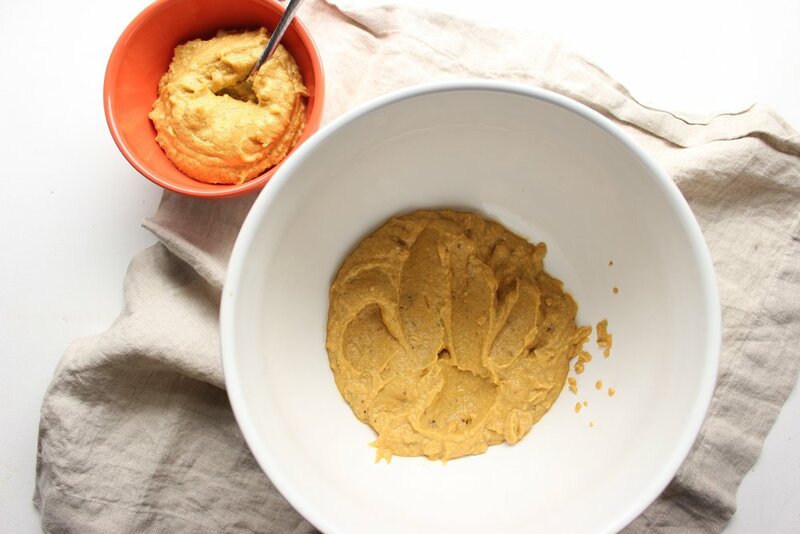 And beans are an excellent source of non-meat protein, so if he’s suddenly off of meat, which toddlers often are, this dip helps to fill him up for a good night’s sleep (hopefully). In a small skillet (bonus if it’s oven safe! You’ll only need one pan! ), heat the olive oil over a medium low flame. Add the onions and cook until translucent, about 5 minutes. Add the garlic and cook for one minute until fragrant. Add the spices and cook for 30 seconds. Remove from the heat and let cool slightly while you prep the rest of your ingredients. Place the cooked onions, garlic, and spices in a blender or food processor. Add the drained and rinsed black beans, cream cheese, salt and lime juice. Pulse several times until the ingredients are well broken up, but not liquified, scraping down the sides as needed. Continue pulsing while you add the water 1 tsp at a time until you’ve reached the right consistency. I like this dip to be somewhere between chunky and liquidy. There is definitely some texture, but no “chunks’ of beans. Put the mixture back into your oven-safe skillet or into a small casserole dish. 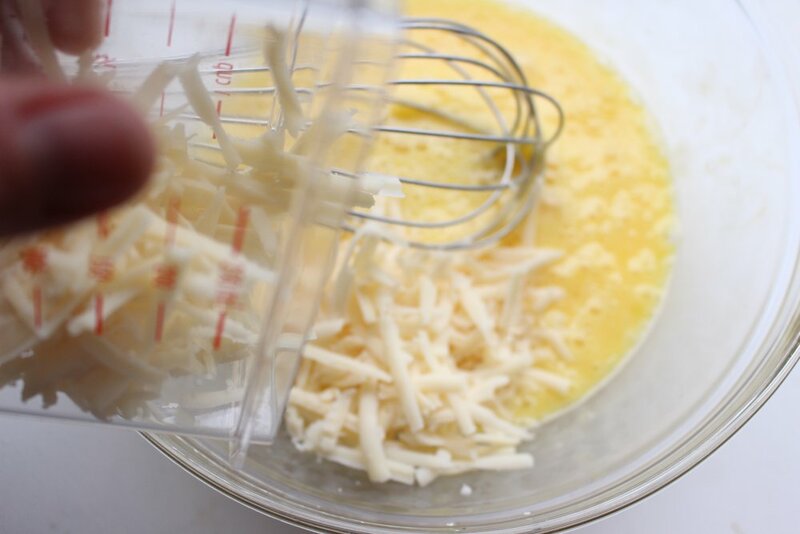 The wider and shallower the dish, the more surface area you have for cheese, so pick accordingly. Top with the shredded cheese and bake in the oven until the cheese is melted and begins to crisp on the sides and bubble in the middle. Fall is here! And I’m all in. I love summer as much as the next gal (tomatoes! the beach! relaxed schedules! sunshine! longer days! ), but I can only take so much sweating before I’m ready for fleeces and squash (leaves changing! fires! apple picking! Halloween! schedules!). This mac and cheese is warming, cheesy, and chock full of veggies. It also works as dinner or lunch (or both!). I’ve made this with some sausage on the side for an even heartier meal, but it’s very filling on its own. - I use half roasted squash and half pumpkin (butternut or acorn squash is my favorite, but you could use kobocha or delicata) because I don’t always love straight pumpkin pasta sauces. There is something heavy and somehow both flavorless and overwhelming about a sauce made with just pumpkin. - The most time consuming part of this recipe is cooking the onions. A longer, slower cook yields much better flavor that significantly improves the final dish. I recommend taking the time. - This recipe makes twice as much sauce as you need. You can either freeze half, or make two boxes (2 lbs) of pasta for a large family. We’ve found that using 1 box of pasta and freezing half of the sauce yields one dinner for the three of us and two lunches for M (and some late-night picking for us). Preheat the oven to 425. Cut your squash in half lengthwise and scoop out the seeds. Place cut-side down on a parchment-covered baking sheet. Bake until fork tender, about 20-30 minutes. Bring a large stock pot of salted water to a boil. (I add 2 heaping tsp of salt to my pasta water and that usually does the trick.) Cook your pasta according to package directions (towards the end of cooking your onions). Reserve 1/2 cup of pasta cooking water. Heat a large sauté pan over medium heat. Add the olive oil and heat for 30 seconds. Turn the heat down to medium low and add the thinly sliced onions. Brown, stirring often, until caramelized, about 25- 30 minutes. Don’t worry if your onions become a little frizzled or fried instead of caramelized. I tend to forget them or have the flame up too high for a minute. Either way, they’ll taste delicious as long as they’re well cooked. Add the garlic and sage to the onions and cook for one minute, or until fragrant. Remove from the heat. In a blender or food processor, combine the cooked onions, garlic, sage, acorn (or other) squash, pumpkin puree, and cheese. Blend on high. Slowly add the milk until you’ve reached your desired consistency. * Scrape down the sides as needed. Pour about 1/2 of the sauce into a large container for another time. Drain your pasta, but reserve ½ cup of the pasta water. Put the pasta back into the pasta pot, top with ½ of the sauce, and thin out as needed with the reserved pasta water. Taste for seasoning and add salt and pepper as needed. *The amount of milk you’ll need depends largely on your squash. Some squash have more water in them, so you’ll need less milk. Start with ¼ cup and add more as needed. Whelp, I'm laid up in bed due to my lower back's semiannual revolt against the rest of my body. Luckily, I've made a bunch of these easy and quick frittatas and the leftovers are great for breakfast, lunch, dinner, or snacks. Or eaten with your hands while watching The Great British Baking Show from the floor. I started making these because it's summer squash season, which means that markets and backyard gardens are flooded with zucchini and yellow squash. There are recipes for galettes and gratins galore and I'm sure they're all delicious. But I wanted something easier and lighter. And what's easier than a frittata? They require one pan and come together so fast. I love adding a salty, garlicky, crunchy kick on top with the combination of panko, minced garlic, Parmesan, and sea salt. I also like to leave the squash in fairly large chunks because otherwise the vegetables disappear into mush. If your kiddos will more likely eat something with less visible squash, feel free to use thinner slices or even to spiralize the veggies. I find that the crunch on top often distracts from the fact that this frittata is vegetable laden. To that end, you really have to use panko or gluten-free panko to achieve that crunch. Regular breadcrumbs won't do the trick. Serve this with ANY pesto from the archives! Heat the oil in an oven-proof skillet over a medium flame and add the onion. Cook for 5 minutes or until the onions are translucent and fragrant. Meanwhile, crack the eggs in the bowl and mix until the whites and yolks are well combined. Add the squash, the shredded Gruyere or Gouda, and a large pinch of salt and stir to combine. Pour into the pan with the hot onions and stir again to combine. Cook the eggs and squash, undisturbed (no more stirring! ), on the stove top for 10-12 minutes, until the edges of the eggs begin to set. Meanwhile, combine the panko, garlic, Parmesan, salt, and pepper in a small bowl and set aside. When you're ready to put the frittata in the oven, top pour the panko mixture evenly over the top. Put in the oven and bake, uncovered, until there is no jiggle left in the eggs, or about 15-20 minutes. If the panko topping browns too quickly, cover it loosely with tin foil until the eggs are cooked. Yield: 6-8 servings, depending on what meal you're eating this for and what you're having with it. TOMATO SEASON IS HERE!!!!!!! I looooooove tomatoes. Love. And so does M (though he mysteriously won't eat them in his lunchbox anymore). M does not always love beans though. He eats them, but they aren't on the top of his list. As anyone who's read this blog knows, I have a relationship with healthy eating. Like all relationships, it takes work and there are lots of struggles. But any article titled, "The Last Conversation You'll Ever Need To Have About Eating Right," I am 100% going to read. I mean, I'm not going to stop having conversations about eating right, but I liked the article and one of my main takeaways was: Beans are good. Full stop. So, we're eating more beans, which is sometimes a struggle with a toddler. These beans are not the healthiest things I've ever eaten. But a little bit of cream and Parmesan go a long way. A boat load of tomatoes, onions, garlic, salt, and fresh thyme also do some heavy lifting to form a dish that is hearty and tasty and takes advantage of the best summer produce. But the secret ingredient here is patience. Reducing the sauce to a syrupy, caramely sauce gives you maximum tomato flavor. And then your toddler will eat beans. In a medium pot, bring well- salted water to a boil for the pasta. Cook the pasta according to package directions. While the water is coming to a boil, mince the onions and garlic. Over medium-low heat, saute the onions for 4-5 minutes or until translucent. Add the garlic and cook for one more minute, or until fragrant. Chop the tomatoes and add them to the onions and garlic. Turn the flame up to medium and cook, stirring occasionally, for 10-12 minutes, or until the tomatoes release their water and begin to boil. The liquid should be at a consistent and vigorous boil. If it isn’t, turn the heat up slightly until the liquid begins to boil. Continue cooking, stirring occasionally, until the tomato liquid has reduced by more than half and become syrupy, about another 8-10 minutes. Add the beans and pasta to the sauce and stir to combine. Cook for one more minute to heat the beans and the pasta through. Season with salt and pepper and sprinkle with fresh or dried thyme. Well, it's happened. M is officially in preschool. He's officially potty trained. He's officially a kid and not a baby. I'm officially unsure of how I feel. On the one hand, I'm so happy! I'm writing a post without a child hanging on my leg! I'm staring down the gaping maw of 4 whole hours to myself every day! On the other hand, it's the end of a really sweet time in our lives. Being home with M all day every day was exhausting and sometimes unfulfilling, but more often it was pretty magical. I was there every time he learned something new or said something hilarious. We had adventures and figured out our new town together and made some friends. Not that those things are over, but it's definitely going to be different. Different in a good way, I hope. We'll see. You know what else is different in a good way? Meatless meatballs. (See what I did there?) Seriously though, we've been trying to cut out meat once a week, but not skimp on taste and IT. IS. POSSIBLE. These meatballs are delicious. They're tender, but don't fall apart. The garlic and onion powder load them with flavor and the Parmesan gives them a toasty crust when lightly sauteed. And a couple of eggs and some panko bind them together without drying them out. - You want the lentils to overcook a little, so I cut back on the water and cook them a tiny bit longer than is necessary. The slight mushiness helps to bind the meatball mixture together. - I've also tried cooking these in a few ways: Roasting keeps the balls very circular, but I miss the slight crunch that comes with sauteeing. And cooking these right in the sauce makes them fall apart a bit. So, sauteeing is the way to go. Combine water and lentils* (see notes below) and bring to a boil over high heat. Turn heat down to low and simmer, partially covered, for the times noted below. Our goal here is a slightly mushy lentil, which will help the meatballs stick together. When all the water has evaporated and the lentils are cooked, drain well over a fine mesh sieve while they cool slightly, about 5 minutes. Combine the lentils and the rest of the ingredients (start with ¾ of the panko and add more later if needed) in a bowl and mix well. The mixture will be sticky and ever-so-slightly slack at this stage, but should be easy to roll into balls. If the mixture feels very slack, sticky, or is hard to form into balls, add the other ¼ cup of panko to the mixture and try again. Form into balls and chill in the fridge for at 30 minutes. Heat the olive oil in a pan over medium heat. Turn the heat down to medium low and add the meatballs. Let a crust form on one side. Flip the meatballs over and crust the other side. The process should take about 12-15 minutes. *If using large brown or green lentils, use 4.5 cups of water for 1.5 cups lentils and cook until water has evaporated entirely, about 30-35 minutes. If using small green or brown lentils, use 3.5 cups of water for 1.5 cups lentils and check after 20-25 minutes. If the lentils have too much bite left, but are dry, add 1/4 cup of water, cover partially, and continue cooking, checking every 3 minutes until water has evaporated or the lentils are mushy enough.